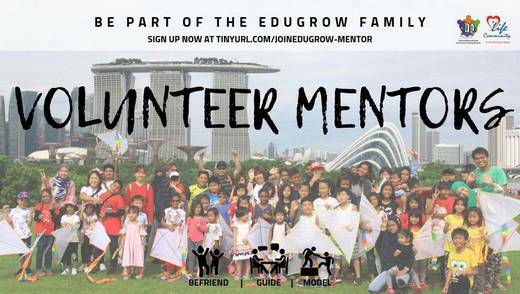 EduGrow for Brighter Tomorrows is a family-centric, early intervention programme that seeks to provide holistic support for children (K2 to Sec 1) from lower-income families living in Marine Parade. Through a community-oriented approach, mentors (like you!) are matched to these children, building on their aspirations, character, education, financial values, and relational skills. Thereafter, they will arrange for a get-to-know-you session, to best match your personality and volunteering preferences to the needs of the children. And not to worry, trainings will be provided! The next Orientation & Foundation Programme is on 23 February 2019 (Sat), 9.30am to 1.00pm at the LCSS Activity Centre (Kallang Leisure Park, #04-07). So hurry and sign up by 21 Feb (Thu)!